6th October – Onwards towards the border. 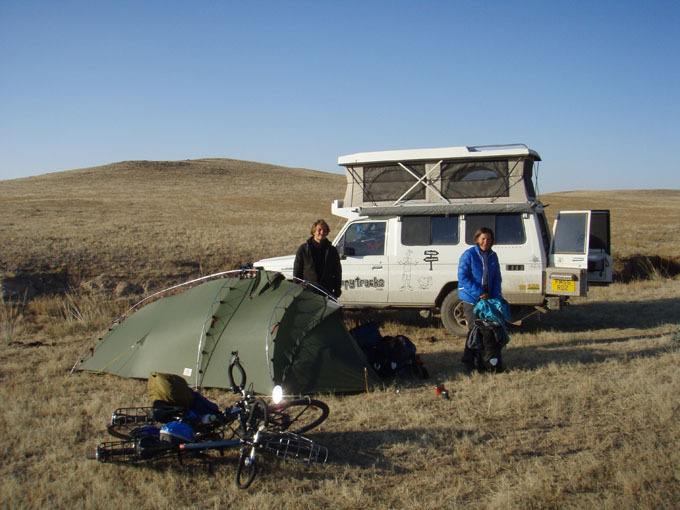 Although we had only travelled about 270km south of UB it seemed warmer. The night was still cold, but for the first time since we got to the Russian border in the Altai we had not had frost on the roof of the camper (inside). After a breakfast of porridge and bread with squares of chocolate on (for Sebastian and Elody) we both packed up. We left them to finish packing their bikes and headed of. It was sad to leave them behind …. we did not envy them the tough and dusty ride ahead! 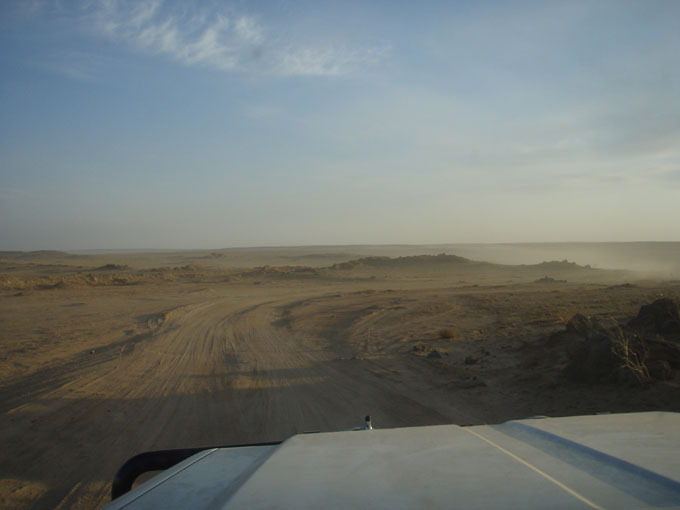 The dirt road continued until about 50km before Saynshand and then an immaculate paved road started. 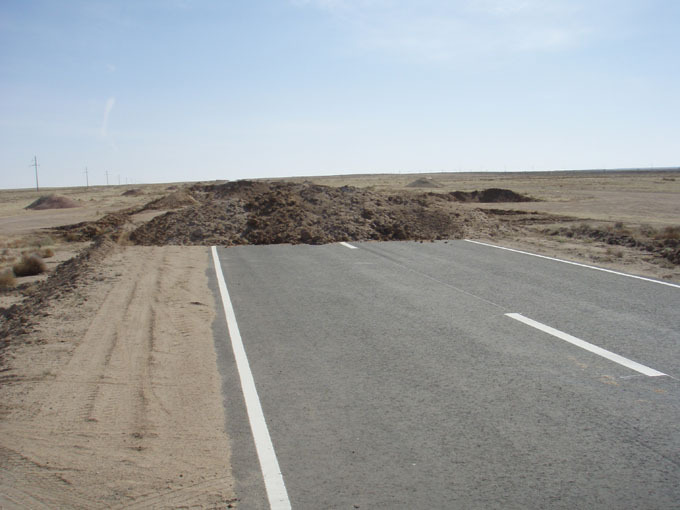 Only problem was that it had piles of aggregate and sand heaped up every km or so to stop you driving on it. In some places we could go on and off to get at least some benefit from it, but most of the time it was faster to stay on the dirt road. 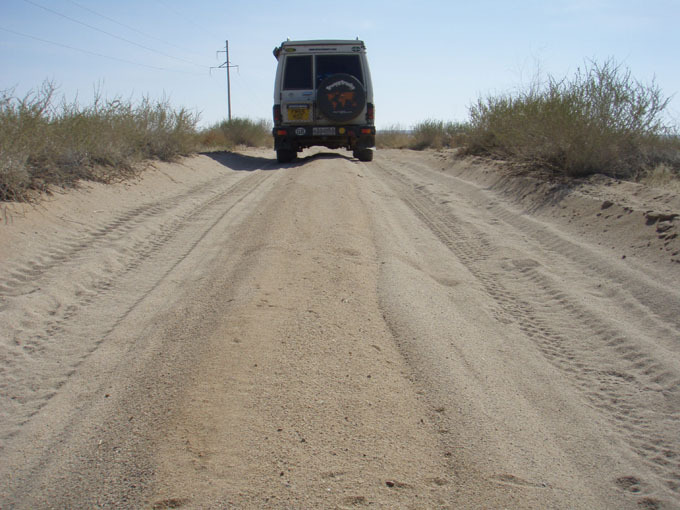 Every time we came to a bad dusty or sandy bit of road we said that it would be a hard bit for Sebastian and Elody and each time we got to a good bit, we were pleased that it would be easier for them. There was however a strong headwind which would have been tough! We refueled at Saynshand and had lunch, then carried on as far as we could. There was at least 100km of the frustratingly, finished but closed road running beside our track. We went on and off it , sometimes driving right over the heaps of soil meant to stop you using the road. 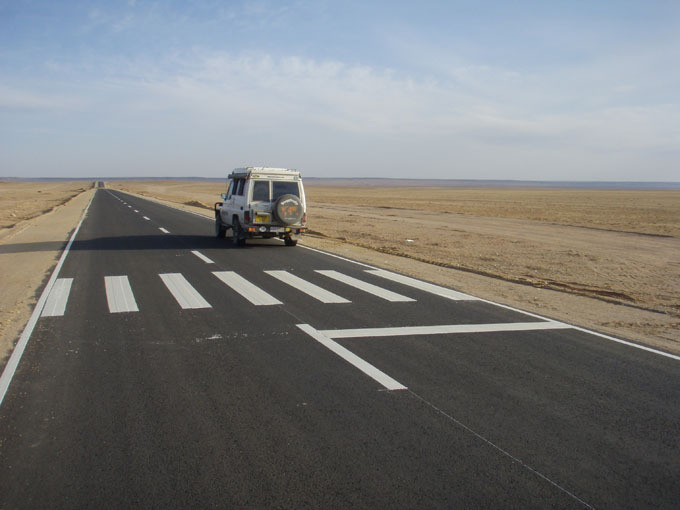 At one point there was a pedestrian crossing … in the middle of the Gobi with no sign of habitation in any direction! Finally the road ended and we were back on onto sandy roads. Some were really deep but most were fine like the one below. As the evening came on the wind picked up and the dust swirled. Again we thought that cycling through this would not be much fun. Having covered 350 km today in 8 hrs driving we had had enough and stopped when the light failed. It left us only about 70km to do in the morning to Zamin Uud.